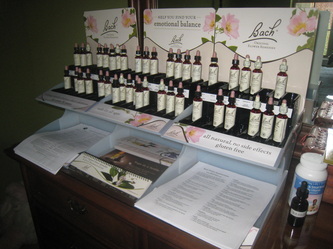 Flower essences are liquid extracts used to address profound issues of emotional well-being, soul development, and mind-body health. They are part of an emergingfield of subtle energy medicine, which also includes homeopathy, acupuncture, color therapy, therapeutic touch and similar modalities. Although flowers have been used for healing for many centuries, flower essences in their modern form were first developed in the 1930's by an English physician, Dr. Edward Bach. He prepared 38 remedies, mostly from English wildflowers. In recent decades, companies such as FES have researched new flower essences from othr plant species. Flower essences may be used for a variety of issues in pets. Pets have emotions very similar to those in humans, and flower essences have been used for hundreds of years to assist people with emotional problems. They are commonly used to calm dogs who are anxious or stressed, for car and travel problems, to help in recuperation from illness, to help animals who have been abused to recover emotionally, motherhood, bullying behaviros, to deal with overwhelm, bonding with new animals and people, handling the grief of losing a human or pet companion, to process new information and learn from experience, to develop a strong confident outlook, to boost vitality when ill and so on. Many stress-related issues can be ameliorated with flower essences so that training is more effective. At the same time, it is possible to have discomforting or physical reactions to flower essences, such as fatigue, headaches or a temporary rash. They sometimes stir up disturbing emotions. This is not an aggravation or side effect, but part of the therapeutic process which can lead to greater health and awareness. These experiences are the body's way of responding to the emotional awakening elicited by the flower ssences, and usually pass within a day or so. So don't be surprised if your pet acts differently at first. How are Flower Essences dosed to pets? Flower essences are typically (but not always) given by mouth. The easiest and most obvious way to do this is by putting drops into the dog's food or water. The most normal dosage instructions are to place 4-8 drops daily in drinking water. It doesn't matter that the drops become more dilute by adding them to a bowl or dish of water. If they were traditional herbal or chemical remedies, this manner of dosing would weaken them. However, because this is an energy medicine, dilution is not a problem. 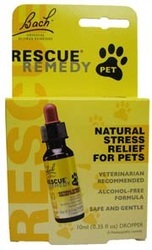 You can even add a couple of drops to food or training treats. 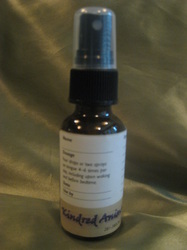 In fact, flower essences can even be sprayed onto the dog or into the air near the dog. Tiny molecules of water containing the signature of the remedy will drift down; some land on skin and are picked up by subtle electrical sensors, and others are inhaled into the system. They can be rubbed into acupressure points and rubbed into the fur during bath time. In most cases, assuming that the problem is a case for flower essences and the correct remedies have been selected, results are usually seen within two to three weeks, and sometimes much sooner than that. Interestingly, practice has shown that milder types of problems, such as everyday fears and anxiety, can take a little longer, perhaps two weeks or so, to be helped. Meanwhile, more severe and acute problems such as shock, strong fears and the severe anxiety of rescue dogs with a history of being beaten and malreated, can often take much less time to react to the remedies. Therapists and owners have often seen very frightened, nervous or fearfully aggressive dogs become calmer within just a few minutes. Remedies such as Star of Bethlehem and Rock Rose seem to be very important for gaining these fast and spectacular results. See the symptoms below to help you choose the appropriate remedy. I also strongly recommend that you learn to muscle test so that you can determine which remedies will be the most useful for your pet. Muscle testing is covered in another section of this website. It is common for a pet to need more than one flower essence, so combinations are the often prescribed by practitioners. We are experienced with flower essences and can interview you and also muscle test you or your pet to determine which ones might be the most effective. Using a custom blend of flower essences made specifically for your animal is the most cost-effective way to purchase flower essences, as a few individual remedies will cost more than a custom blend purchased here. Agrimony – Recommended for dogs with fleas as it can help calm her down and stop the itching. Of course, you need to use Diatomaceous Earth and/or Cedar and/or Brewer’s Yeast to control the fleas. Aspen – Helps in comforting dogs with thunderstorm phobia. Also consider Thundershirt. Beech – Recommended for picky eaters and dogs that constantly bark. Cerato – Aids dogs with performance anxiety. Cherry Plum – Helps dogs who don’t like riding in cars; that suffer from anxiety and panic attacks or chew on self or tail. Clematis – Excellent to use while training. Helps to focus attention. Also helps in recovery from surgery. Crab Apple – Helps in detoxification. Rock Rose – Helps dogs who have been traumatized, rescue dogs with uncertain or abusive past; helps build courage. Star of Bethlehem – helps with all types of trauma including grief. Dogs grieve the loss of family members and other pets just like we do.